Forget about the Midas Touch – you want everything you touch to rust! Leave the fears of looking a tad gaudy with gold behind because rust is the perfect color to add a dash of luxe to your look. Rust forms on metals that contain iron when they’re exposed to oxygen and moisture for a long period of time. The metal weakens and reveals textural layers of deep oranges and reddish browns, creating an intricate pattern. 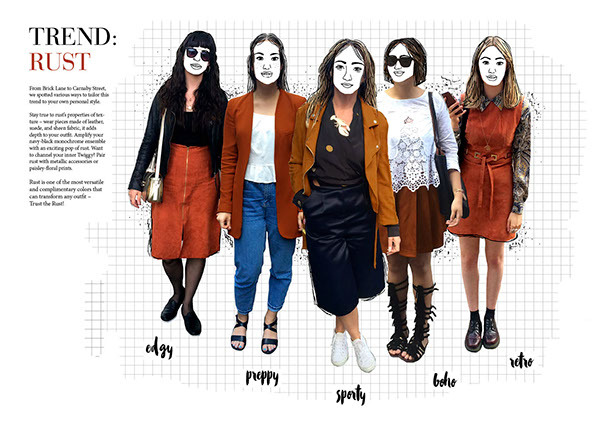 This rusting process instantly adds a uniquely vintage vibe to any outfit so don’t be afraid to get a little rusty! From Brick Lane to Carnaby Street, we spotted various ways to tailor this trend to your own personal style. Stay true to rust’s properties of texture – wear pieces made of leather, suede, and sheen fabric, it adds depth to your outfit. Amplify your navy-black monochrome ensemble with an exciting pop of rust. Want to channel your inner Twiggy? Pair rust with metallic accessories or paisley-floral prints. 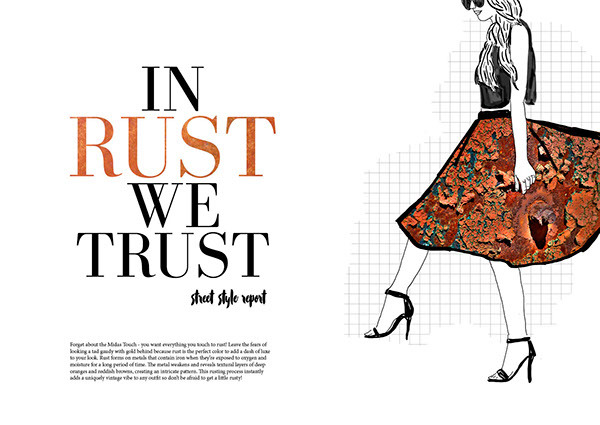 Rust is one of the most versatile and complimentary colors that can transform any outfit – Trust the Rust!